Nevada's Greatest is the WTII and world debut from this extremely talented artist. 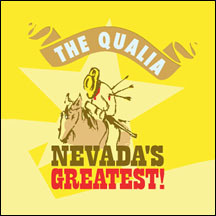 The music on Nevada's Greatest! features a compelling mixture of lush synthesizers, sequenced beats, and sparse guitars. Built for road trips, living rooms, and dancefloors, the music drifts from song to soundscape, evoking nostalgia, tension, and wry humor at once. Lyrically, the record includes a unique combination of fantastical western storytelling and reflections on current affairs, through topics bordering on personal, political, and sociological. The first single Better, is a complicated and twisted tail of love, betrayal and revenge. It blends the vocal delivery of REM, the lyrical style writings of Johnny Cash and the electronic prowess of the Postal Service meets Wolfsheim.